Thinking local and fresh? Where are South OC's Farmers Markets? Posted by Teresa Mihelic HelpDesk on Thursday, August 23rd, 2012 at 12:24pm. With so many concerns about the food we eat, many of us are trying to go the 'organic' way, and what a good way of doing this by also buying locally. Farmer Markets are a great idea with the convenience of also having some fun, as many of them often have live music or some kind of entertainment - or , like San Clemente or Laguna Beach, the locations where they are held at, are top notch - a little walk and you'll end on the beach. Farmers markets occur at different days in the different cities of Orange County, so if you can't attend to one on a weekend, there's some options for the weekdays. Full of fresh vegeatables and fruits, farmers markets in Orange County are not only that! You can usually find baked goods, homemade foods, cheeses, hummus, seafood and , as well as soaps, lotions, arts and crafts. San Clemente : held on Sunday's from 9am to 1pm, this is a great opportunity not only to enjoy the fresh produce, but to walk the beautiful Del Mar Street. And when you are done, head to the Pier area for more fun! 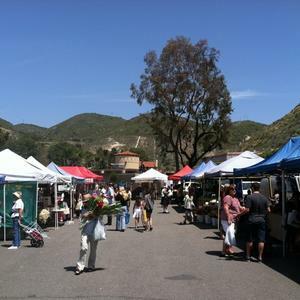 Where: 200 block Avenida Del Mar Dr.
Dana Point: this one is held at the Dana Point Plaza on Saturdays, and on every second Saturday of the month this farmer's market combines with a crafts fair. The hours are 9-3pm on craft fair days, otherwise 9am to 1pm. They have a great selection of organic, in-season fruits and veggies. And this one particularly for us, has the best hummus and tamales we have had in a while. Mission Viejo: this one is done on Friday mornings at the Civic Center. This farmers market just opened up in January 2012, and eventhough is small, they have all the good fruits and veggies of the season, some organic produce as well as a fish monger, flowers, breads, teas, and many other options. Definitely something to check out! San Juan Capistrano: Each Wednesday, residents and visitors can enjoy purchasing fresh flowers, produce, and specialty foods at the San Juan Capistrano Farmers' Market. The market features up to 30 vendors and is held at Yorba Street and Camino Capistrano right in the heart of downtown San Juan Capistrano. Laguna Niguel : this one is held on Sunday mornings and they have a really good selection of organic and natural growers, the freshest seafood (unbelievable), and lots of other unique offerings. For some, this one is one of the best in Orange County, with the convenience of having a grocery store that carries organic nearby, in case you can't find something. Laguna Beach: held on Saturday mornings, this one is a small one but with a great selection of fresh and natural organic produce, with the big plus of the location, just the walk around it makes it for a perfect way to spend a Saturday morning in OC. Advice: get early, as parking in Laguna Beach can be difficult sometimes.